This is the home of vl2ppt, a simple program to create PowerPoint presentations from Visual Liturgy services. I put it together because I needed some way of getting liturgy into PowerPoint, and was getting a bit fed up with copying and pasting each item. vl2ppt works for me, so far; it may work for you too. Nothing, though there is other software you will need to have bought to be able to make use of it. It is licensed under the Apache License, Version 2.0. Some of the style information that Visual Liturgy supplies (e.g. things like verse numbers) is not yet handled. Further tweaking of its output will be needed. In particular, some slides will contain far too much text and will need to be split. I would love to write some PowerPoint macros to help with this, but have not yet done so. (Contributions welcome!) For now, select the slide, copy and paste it so you have a copy (or copies), and then cut out the bits you don’t need from each slide. Copyright information is included in the generated presentations, in as near as I can get to the same format as Visual Liturgy’s “Open in Word Processor” function. But it’s your responsibility to check that the copyright information in your presentation is correct before you project it. I have only tested with Visual Liturgy 4.0 for Common Worship – not the Methodist Worship Book and Church of Ireland versions, nor Visual Liturgy Live. Visual Liturgy 4 (Church House Publishing). Microsoft(R) PowerPoint(R) 2003 – it is possible that it will work with older versions, but I have not tested this, nor have I tester PowerPoint(R) 2007. Java Runtime Environment, Version 5.0 or later. This is a free-of-charge download – go to http://www.java.com/en/ and click on “Java Software Free Download”. vl2ppt itself – see below. Unzip the files into a convenient folder somewhere. The especially keen might also be interested in the source download if you’re interested in how it works or in modifying it. First create your service in Visual Liturgy. Make a note of where you saved the file. Click Browse… under “Select Visual Liturgy XML file” and locate the file you just exported from Visual Liturgy. Choose other options to taste. 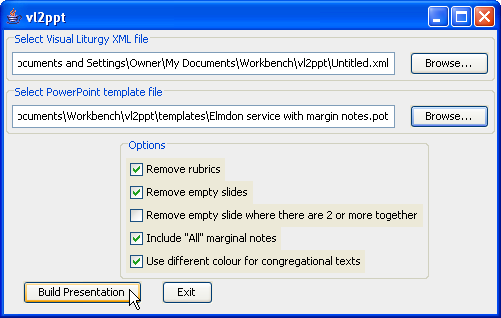 If you selected “Elmdon service no margin notes”, untick “Include “All” marginal notes”; if you selected “Elmdon service with margin notes”, tick “Include “All” marginal notes”. vl2ppt will start up PowerPoint automatically do its magic. It may take some time! Switch to the PowerPoint window and save your presentation. Tweak to taste.